Pssst! Hey, mate! Do you want to buy a dead body in pristine condition? Don't worry, it isn't very expensive. Plus if you're lucky, I'll throw in a 88-minute movie made in 2010 at no extra cost. You know. Like that one Directed by: John Landis; and Starring: Simon Pegg, Andy Serkis, Isla Fisher, Tim Curry, with Bill Bailey. Come on, pal. You know you want to. However, it is with great regret, that this bloodcurdling task isn't always easy for Burke and Hare to perform. For a start, they have to keep on asking themselves the all important question of how they can obtain these deceased cadavers. Natural causes? Misadventure? Or murder? Plus in addition to this, a local lady that goes by the name of Ginny (Isla Fisher), attempts to swindle Burke out of his funds by staging the Scottish play, Macbeth. Oh! And in a round about way you could also say exactly the same thing about those gangsters too. Minus the 'play angle' of course. But don't you worry you pretty little heads off, folks! Cause as luck would have it, over time this money making venture seem to pan out for Burke and Hare just fine. Going so far that Doctor Knox asks them to step up their game, because he's hired some French chap to photograph the sixteen corpses they've obtained for him, and he wants to present these celluloid's to the King of England. Still. That's most probably why what next transpires all goes to Haggis when the Edinburgh Militia begin to investigate a series of murders. As Professor Monro (Tim Curry) gets very cross - you can't make some profit without some loss - a staged production leads to a deadly shop - and at the end of the day, whilst one entrepreneur is saved, the other one gets the chop. Considering 'Burke and Hare' comprised of an all-star cast of British comedians, complemented by an additionally brilliant comedic director, I honestly would've thought that it would've been an awful lot funnier than it actually was. Now please don't get me wrong. I'm not trying to imply that I didn't enjoy watching this movie at all. No. Of course not. Initially I got a right kick out of how this filmic-farce was presented in a very English yet timely fashion -- both aesthetically and tonally -- and appeared almost imitative of the Laurel and Hardy films of old. Also, I did appreciate following the developing and warm-ish partnership of Simon, Serkis, and Jessica, plus how their respective characters integrated themselves into the overall intriguing pretext. Oh! And before I forget, I've got to mention loving those cameo appearances too! I mean, how can I not dig spotting the likes of Bill Bailey, Paul Whitehouse, Ronnie Corbett, Reece Shearsmith, and Steven Merchant, scattered throughout this flick! Having said that though, my one major problem with this adventure was how its central narrative persistently got interrupted by a number of obvious sub-plots barring its path. Inadvertently giving the film -- as a whole -- a somewhat timorous start / stop quality I've personally never been very keen on. Again, please don't get me wrong, I'm not trying to abate any of the actors involved with these 'secondary sub-plots'. Cause if truth be told, I do have a huge crush on Isla Fisher, plus I've always looked forward to seeing Tim Curry or Tom Wilkinson on screen. It's just that on a conceptual level these 'obvious delays' were just that. Obvious delays. And in my eyes they held up the pace of this adventure instead of allowing it to 'roll on' in a more innovative and comical fashion. Still. What the f*ck do I know, huh? I'm just another run of the mill movie reviewer, and these are my filmic-facts. (1) 'Ealing Studios' first released this $10 million dollar production on the 29th of October, 2010, and managed to claw back $4.3 million dollars at the box office. (2) Loosely translated, this project was entitled 'Hands and Feet for Love' in Russia, and 'Cheater Bodies Themselves' in Greece. (3) This was the first time in almost thirty years Jenny Agutter, David Schofield, and John Woodvine, was directed by their former 'An American Werewolf in London' cohort, John Landis. Also, this was the first flick John directed since being out of the business for thirteen whole years. (4) The majority of this movie was shot in London's legendary, 'Ealing Studios', as well as on location throughout numerous parts of the United Kingdom. This includes Dashwood Mausoleum, in West Wycombe; Sevenoaks, in Kent; Luton Hoo Estate, in Bedfordshire; plus Edinburgh and Stirling Castle, in Scotland. (5) The tagline used to promote this picture, was, 'No Job Too Small. No Body Too Big. No Questions Asked'. 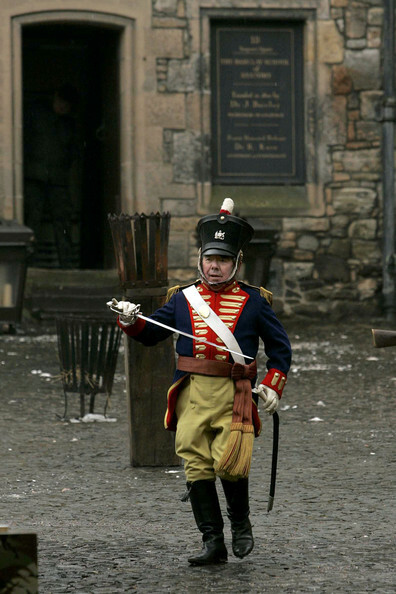 (6) This story was limply based on a series of murders committed in Edinburgh, Scotland, in 1828. According to legend, the 'West Port Murders' were attributed to two Irish immigrants, William Burke and William Hare, who sold the sixteen dead bodies they 'obtained' to a Doctor Robert Knox. Robert then dissected them in-front of his medical students for anatomical purposes. (7) Way before pre-production, there was a rumor circulating that stated John Cleese and Dan Aykroyd were going to play the two main leads in this film, or alternatively, Colin Farrell and Ewan McGregor. (8) One of the main reasons John Landis wanted to direct this movie, was because he saw it as an evil version of a 'Laurel and Hardy' adventure. All in all I'd say 'Burke and Hare' was more like 'Smirk and Dare'. The comedy was funny, but not that funny. The pretext was daring, but not that daring. And overall this movie is well worth a watch, especially if you'd like to see a bastardized yet modern version of a Laurel and Hardy film.